Saving money is a big deal around here, especially since we just got back from vacation and have all of the back-to-school expenses in front of us. With all new school uniforms, shoes and school supplies to have to purchase, I need to find as many ways to save money in other areas of our life. One thing that I aways get a great value on that doesn't cost me any added stress is Sammy's phone bill because she has Walmart Family Mobile. She's going on two years with Walmart Family Mobile and in recent months we upgraded her service so she has faster unlimited data (10GB of 4G LTE) and just got her a new phone for this school year. It's pretty exciting to be able to head back to class with a new phone, especially for me because I didn't spend as much as most parents do on their kids phones and she's happy. Plus we're secure in the fact that we can get in touch with her at any moment should an emergency arise. The Walmart Family Mobile PLUS Plan offers: Unlimited Talk, Text, & Data which includes up to 10GB of 4G LTE plus a free movie on VUDU every month ($7 value) per line for $49.88. Her new phone is the Coolpad Catalyst which only cost *$59.88 and has everything she needs to play games, go online for school activities and stay in touch with family and friends. 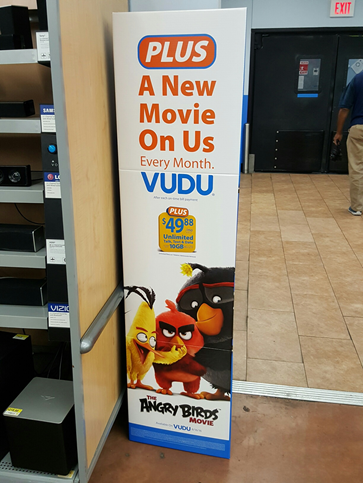 One of the perks of the Walmart Family Mobile Plus plan is that she gets one free VUDU movie per month and this month it has been all about the Angry Birds! Funny that Angry Birds are back, I remember when they came out years ago and how popular they were. My older girls who loved them back then, are as excited as she that they have made a comeback. As soon as she found out that the Angry Birds movie was available, she invited her friend over to come and watch with her by sending her a photo text from her new phone. With a large data bucket of 10GB of 4G LTE data Sammy can watch the movie while taking photos to text her sisters, play Angry Birds Action! after the movie, and I don't have to worry about her going over on data or extra charges. With everything that kids and adults do on their phones these days, limited data plans are just too restrictive. 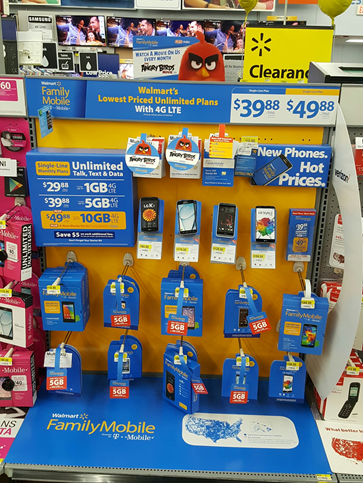 You can find the Walmart Family Mobile Plus plan and phones at your local Walmart store, simply look for the mobile phone area or kiosk and start by choosing your cell phone. Next pick up a starter kit which is normally $25 and right now on rollback for only $19.88. The Walmart Family Mobile Plus service bills you later so you start service for only the cost of the phone and $19.88! How does that compare to other carriers? That's exactly why we chose Walmart Family Mobile Plus for all of the kids in our family. Visit the Walmart Family Mobile Hub to find an in-store event near you to meet with a Walmart Family Mobile rep. At the event you can get a code for a free power up for the Endless Runner Game on the Angry Birds Action! app. Find the Angry Birds Display and Scan the Angry Birds code on the displays to unlock a selfie augmented reality experience with the Hatchlings.